A Ponteland monument was lit up on an evening earlier this month to support a national campaign. 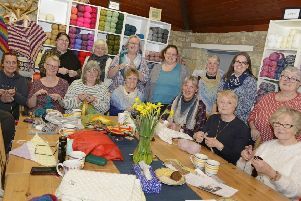 Organised by Ponteland town councillor Christine Caisley, the Pele Tower was bathed in purple, one of the Suffragette colours, in honour of International Women’s Day and campaigners from Women Against State Pension Inequality (WASPI). The lit up Pele Tower in Ponteland. She has given her backing to the cause, which aims to ‘achieve fair transitional state pension arrangements for all women born in the 1950s affected by the changes to the state pension law’. Campaigners are calling for a ‘bridging’ pension to provide an income until state pension age, not means-tested, and compensation for the losses of those women who have already reached their state pension age as a result of the ‘lack of information’ given to them by the Government when it decided to increase this age for women to 65, the same as men. Jane Cowley of the Berwick-upon-Tweed constituency WASPI group, said: “Of course, we support bringing about equality in pensions between men and women. “But the problem is that the Government didn’t inform women when they made the change in 1995.